Stay at this boutique Melbourne motel, located in the suburb of Highett, a short distance from Southland Shopping Centre and Highett Railway Station, giving you easy access to Melbourne's City Center. Bayside beaches are just three kilometers away. 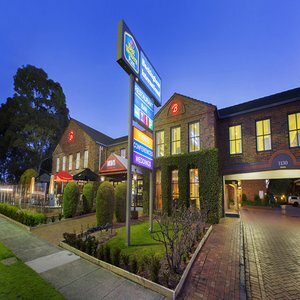 The BEST WESTERN PLUS Buckingham International offers 4 Star accommodation in Melbourne, including 67 rooms and four apartments. All rooms feature free wireless broadband and eight channels of FoxtelÂ® cable television. Other facilities at this Melbourne hotel include a pool and barbeque, set in quiet, immaculately groomed gardens. The BEST WESTERN PLUS Buckingham International is renowned for weddings and functions, and can accommodate up to 150 guests, while AJ's Bar & Restaurant offers a very cozy but informal dining experience. For superior customer service and a convenient location in Melbourne, make a reservation at the BEST WESTERN PLUS Buckingham International today!